Oh, goody. We've "fallen back" to Standard Time once again. Those of you who know me and have glimpsed my collection of various soap boxes will appreciate the fact that I can reasonably get on this one just twice a year. Honestly, now, don't you think "Daylight Savings" loses at least some of its purported meaning when it lasts for roughly seven months? If you have poultry, specifically one or more roosters, you know how the change to Standard Time has affected them: NOT AT ALL. Our roosters, bless their little hearts, still go through their routine of crowing for a few minutes about an hour before dawn. Do they care that our atomic clocks re-set themselves at 2 AM last Saturday? They do not. Did they gather around the 3-gallon drinkers to discuss how to use the "extra hour of sleep?" Doubt it. I love it that these supposedly unintelligent creatures make this transition so smoothly, and you know why they do? Because nothing actually happened! I have not been in the habit of wearing a watch for many years now, so it's interesting to me how much I still am aware of the time. And although the birds are blissfully unaware (I think) of what the hour is at any given time, they do definitely have their routines, which probably accounts for why we're paying attention to the time during the day! As sunrise approaches, the roosters start crowing. (It's a myth, though, that roosters crow simply to announce the arrival of dawn; if they do happen to crow right at sunrise, it's frankly just a coincidence.) Once it's fairly light, all the birds become active and want to leave their respective roosts and head out for a busy day of foraging, dust-bathing, sun-bathing, mating, and debating the finer points of the pecking-order rankings. 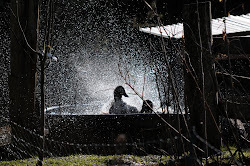 The ducks, who seem to stay up late at night partying (we can hear them talking to each other at all hours), are quite active and energetic for the first couple of hours in the morning, then settle into a nice long nap. Lately they haven't been going down the hill to the pond, but when they do, they always run up the hill once or twice during the day to get a snack; they are amazingly consistent about the timing of this. The turkeys also have regular nap times, but mostly their routine follows ours: When we're outside, they follow us around. When we're inside, they walk around the house, peering in every window, trying to see where we are and what we're up to. (Makes me glad our bedroom is on the second floor.) 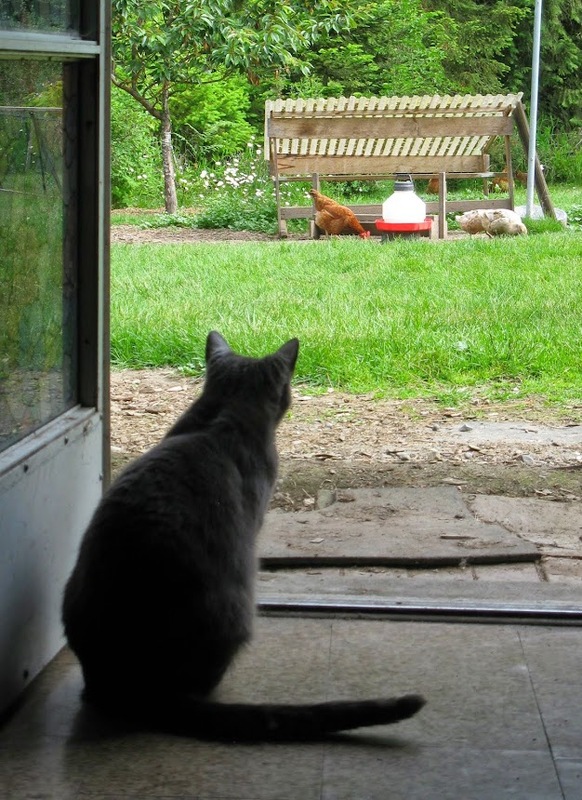 On sunny, dry days, they like to dust-bathe with the chickens, always quite a sight to see. 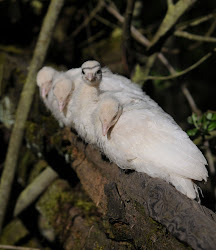 Birds synthesize Vitamin D from sunshine like we do, and the turkeys and chickens look quite funny when they're sunbathing; they recline in a sprawling, wings-outstretched position that sometimes makes them look, well, dead. Toward the end of the day, about an hour before they head into their coops, all the birds gather around the feeding stations for a bedtime snack and a nice drink of water. This time of year we generally start giving them extra corn at night; the additional carbohydrates help them generate body heat while they sleep. What it comes down to is that our chickens, turkeys and ducks are not enslaved by any clock but their internal ones. They get up when it gets light; they rest when it gets dark. It's true that we humans have to find a balance between being completely schedule-driven and being completely selfish about how we use our time. However, I do think it's good to remember that it wasn't so long ago that we didn't have the benefit of 24-hour electric lights that allow us to artificially extend our waking hours. The birds know how to make the most of the available daylight hours at any time of year. Maybe they know something we don't. Very cool blog. 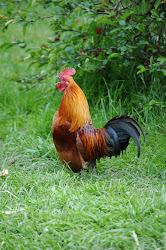 Dina shared your site with me because I have chickens myself in West Seattle. Love that you're living off the grid! Looking forward to reading more. Thanks! I imagine it must be very different keeping chickens in the city; I lived in Seattle myself until we moved out here in Spring 2006. If you're ever in the Sequim area, let me know, we'd love to have you visit. You are so right about Daylight Savings (should I put that in quotes?). Wasn't the original intent to help farmers by "giving" them more daylight hours during the long harvesting days? I'm curious to know if farmers (ones with crops to harvest) still find this beneficial; certainly in your case, since you're farming poultry, as you said, there is no difference at all! Hmm... is this a commentary on the relative intelligence of chickens?? Well, like I said, the chickens aren't the ones who wait for seven months for the one night out of the year when they get an "extra" hour of sleep! I wonder if anyone (farmers or others) actually benefits from Daylight Savings? Hmmm... retailers, maybe? Social network sites? Hey! What about bloggers?? I also agree with the daylight savings remarks you made. So very true!